After several days of record rainfall, South Carolina is experiencing heavy flooding throughout the state. Between Friday and Sunday, the southern state experienced as much as 20 inches of rainfall, causing flash floods and substantial damage. The rain stopped on Monday, but the death toll has reached as high as 10 individuals, and more may be revealed. Providing evidence to the natural disaster that has crippled the state, the photos of the South Carolina floods are heartbreaking. According to Gov. Nikki Haley, who requested a major disaster declaration from President Obama, 40,000 South Carolinians are without water, while 26,000 have lost power. Although the rain stopped on Monday, 550 roads and highways were closed throughout the state, and floodwaters were not receding. "This is not over — just because the rain stops doesn't mean we are out of the woods," Haley told reporters on Monday. "Even though you're not seeing rain, there is still water out there." 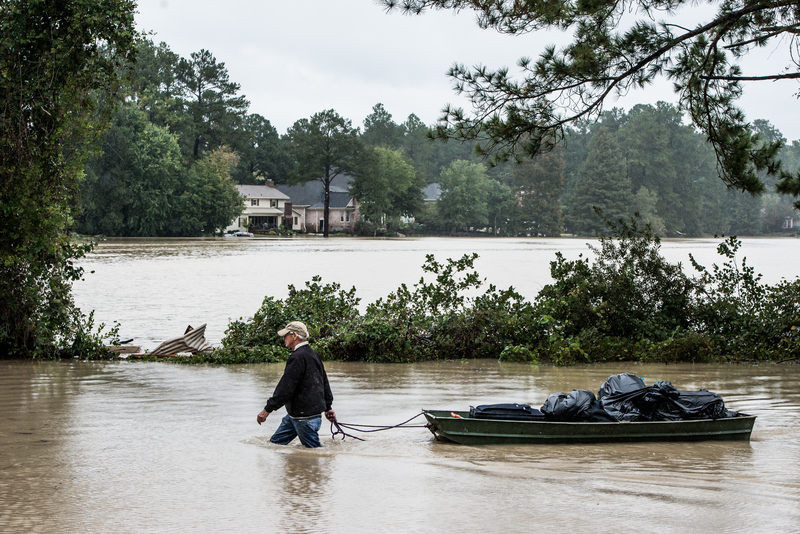 Unlike previous natural disasters in South Carolina, the flooding isn't the result of a hurricane making land fall. Although Hurricane Joaquin contributed to the rainfall, Haley and meteorologists are accrediting the catastrophic flooding to a "1,000 year storm." While that sounds extremely cryptic, according to CNN, it's meteorologist terminology for a storm that has a one in 1,000 chance of happening each year. According to Haley, with the help of State Troopers and the National Guard, there were 150 water rescues and 25 aerial rescues on Monday. Firefighters from the surrounding states and counties descended on the flooded areas to help as well. Although the total damage of the flood has not yet been estimated, hundreds of roads, homes, and businesses were flooded as a result of the rains. Due to fear of tainted water, South Carolina residents were encouraged to drink bottled water or boil their own at home, leading to overrun supermarkets and a water shortage in some areas. Some Charleston residents, however, tried to make the best out of the situation, while others lent helping hands. According to CNN meteorologist Chad Meyers, although the rain stopped on Monday, some rivers and creeks may not recede for up to two weeks. The full extent of the damage has not yet been determined.